How can our research help you? Research is the foundation for every solid trading approach. You can gather statistics for every scenario you can come up with. If a market moved “X” ticks, without reversing “Y“ ticks, how likely is it that it moves another “Z” ticks. How likely is a scenario about to happen and can I capitalize from it – if a scenario has a good enough occurrence and a positive expectancy (how much you expect to earn from each trade for every dollar you risk) it merits further attention. Statistics are not only useful for finding entries or exits, but for answering other research questions as well. Does it make a difference to compute a Volume Profile on tick or minute data? This sample research project tries to answer the question raised above. Does it make a great difference if a volume profile is calculated using tick data or is using the volume gathered from 1 minute bars accurate enough. This is an important question as when it comes to longer term profiles the necessary tick data might not be easily available. It’s clear that using volume information from one minute bars will be less accurate, but will the difference be too great to base trading decisions on those volume profiles? To answer this question we computed the Volume Point of Control (VPOC) over a sample size of 1088 trading days for the E-Mini S&P 500. Then we compared the results for using tick and one minute data. The result is shown in the histogram graphic. On roughly 30% of the days there is no difference in the VPOC at all. The first standard deviation (meaning the area where 68.2% of the values are found) is only four ticks wide, meaning the difference is only two ticks or less 68.2 % of the days. There are a couple of extreme outliers and these are to be found on days with showing a double distribution or several distributions. 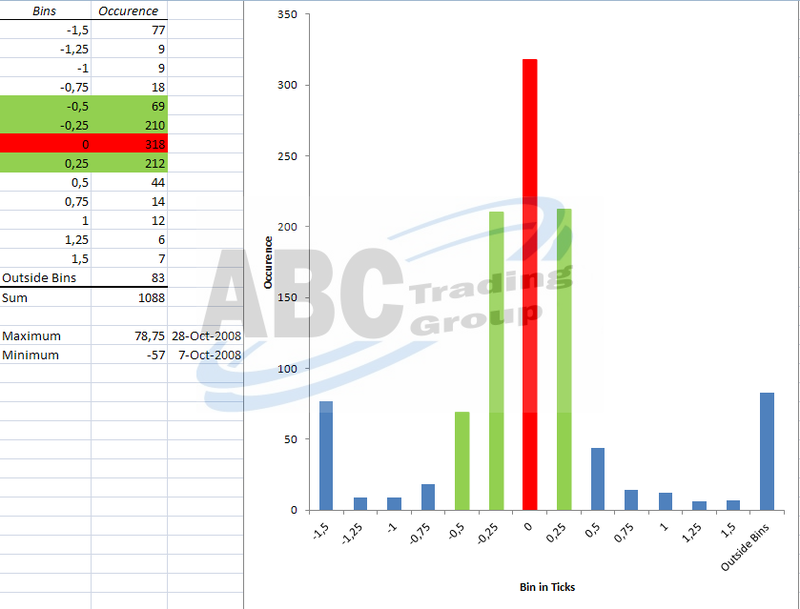 If the highest volume within those distributions is close to each other, it becomes more likely for the VPOC on the minute charts to be within the different distribution compared to the VPOC calculated from the one tick chart. Looking at the results it seems accurate enough to use volume profiles calculated from minute charts. You will have slightly different VPOCs (and other significant levels as well), but this is not rocket science, you can live with this difference. On double or multi distribution trend days one can argue that in fact there is more than one VPOC and only using one is not correctly reflecting the market behavior this day.